Files and images about the American Volunteer Group commanded by Claire Chennault. The AVG Flying Tigers defended Burma and China with their shark-faced P-40 Tomahawks in the opening months of the Pacific War, December 1941 - July 1942. A war hero we've never heard of? "A Native American war memorial is coming to Washington," writes Dana Hedgpeth in the Washington Post, slyly adding: "Here are six Native veterans you've never heard about." Boyington's mom had married young and pregnant, and the marriage soon became a battleground, with her husband accusing her of infidelity. So the child's parentage was a bit of a question mark. 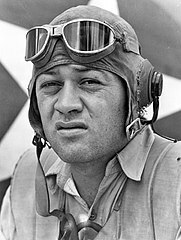 His Wikipedia entry makes no mention of Native American heritage, though oddly it is linked to another Wiki article about "Native Americans and World War II" -- which article, in turn, makes no mention of Pappy Boyington. "I tried twenty years ago to find anything definitive about the heritage of his mother, Grace Gregory," Bruce Gamble emailed me. "One of her nieces claimed that Grace used to boast about being part Hunkpapa Sioux, but I never did uncover anything." The Hunkpapa lived in what is now Montana, and were among the victors in the Battle of the Little Bighorn, aka Custer's Last Stand. Again, Wiki has a list of Hunkpapa notables, which does not include a Boyington -- who in any event probably wouldn't have passed muster as a member of the tribe. "Even granting Pappy a liberal percentage of Native American heritage," Bruce concluded, "he would be no more than 1/4" -- that is, his maternal grandfather might have been a tribal member. Lauchlin Currie: a spy at the heart of the AVG? Is this Tomahawk Number 23? Did the RAF 'sell' victories to the AVG? The strange journey of "Little Olson"
What about that 'phantom P-40' shot down in China? It's official: the AVG fought for the U.S.
Posted April 2019. Websites © 1997-2019 Daniel Ford; all rights reserved.